The present study is performed to identify the blending proportion of cetane improver for partial substitution of ethanol with diesel to achieve fuel economy and emission control. This is case of multiple attribute decision making problem which is solved using Taguchi GRA. Taguchi method is used to decide the proportion of blend in fuel sample to achieve maximum improvement with minimum number of fuel sample and grey relation analysis is done to identify the significant factor along with optimize fuel proportion. Using Taguchi method, nine different fuel samples containing mixture of ethanol, 2 ethyl hexyl-nitrates and diesel were prepared. Each sample was tested on computerized single cylinder CI engine test rig at constant speed and variable compression ratio at 16, 17 and 18 and variable load conditions. After Grey relation analysis of performance and emission results of experimentation, it is observed that D80E20EH3 by ranking method and D80E10EH3 by mean method are optimum fuel sample sequence. Confirmatory experimentation also shows that experimental GRG is close to predicted GRG of 0.8387 hence optimum sequences is acceptable. The optimum sequence shows improvement in fuel economy and lesser NOx emission with little increases in smoke. Ethanol is getting widespread acknowledgement as renewable alternative fuel for diesel and as oxygenate providing potential to reduce particulate emissions [1, 2]. 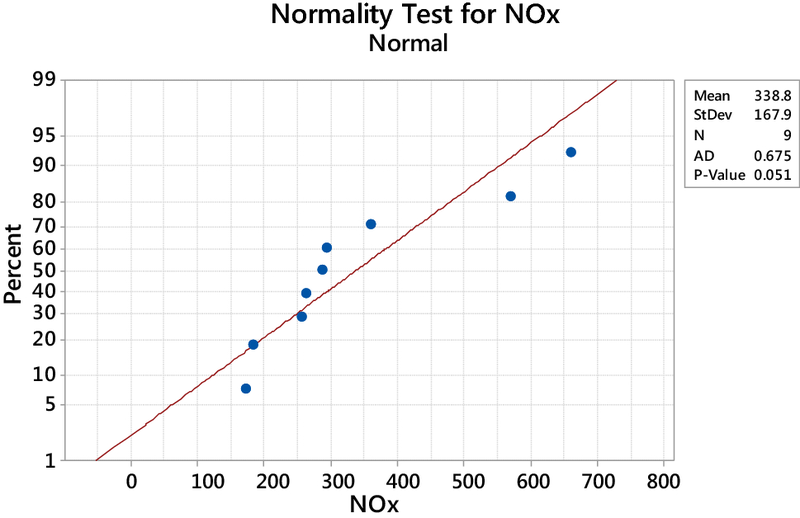 With ethanol blend of up to 5–10% in diesel, smoke density greatly reduces with higher percentage while NOx show little or no reduction compared to neat diesel . The better atomization and vaporization of fuel is achieved with use of 15% ethanol due to its lower density and NO emission of the engine run on the is also found to be lower than that of diesel due to the higher value of latent heat of vaporization . 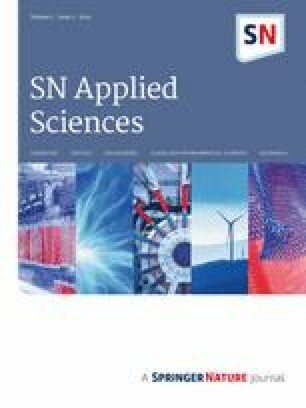 The work on ethanol-methyl soyate blend with diesel (5:20:75) for heavy duty engine shows significant reduction in PM emission while 2–14% rise in NOx emission without changes in CO emission as it is more dependent on operating conditions . This work on blending of n-butanol with diesel shows that, smoke formation is lower, CO formation is lower at all load condition except at higher load while HC formation is high at all load condition except at low load condition [6, 7]. With the increased in ethanol results in Uses of ethanol lower the cetane value of Diesel which lend result in increase in ignition delay and decrease in total combustion duration . Study on use of bio-ethanol at 5%, 10% and 15% with diesel shows longer ignition delay by 4.4% at full load condition than that for pure diesel. 5% Ethanol emulsion gives better performance and lower emission than 10% and 15%. NOx and smoke were reduced by 4% and 20% . Uses of ethanol lower the cetane value of Diesel fuel which has undesirable effect on combustion properties. Low cetane number value generally has a tendency to exhibit longer ignition delay due to their ignition quality. This can be improved by adding small amount of ignition improvers or cetane number improvers. Examples of cetane improvers are organic peroxides, nitrates, nitrites and various sulphur compounds. Earlier, alkyl nitrates isopropyl nitrate, primary amyl nitrates, primary hexyl nitrates, octyl nitrate were commercially used [10, 11]. THC and CO slightly increases for ethanol–diesel blend but addition of cetane improver increases Total Hydrocarbon (THC) conversion efficiency up to 40–60% [12, 13, 14]. An ignition improver of up to 7% by volume would normally be required to enable the ignition of alcohol fuels in CI engines . Due to high their cost, cetane improver application is limited and it also makes the fuel expensive in the present study possibility of use of DoE and its application in identify the optimize percentage of 2EHN and Ethanol is investigated with load conditions. Taguchi method is scientifically disciplined mechanism for evaluating and implementing the improvement in product, process, material, equipment. The aim of this method is improving the desired characteristics and reducing the number of defects by studying the key variables (Fig. 1). In present work Compression ratio, load, ethanol and 2EHN have been chosen as the design factors to identify their effects on the desired response variables of NOx, Smoke and BSFC. Each factor is assigned into three levels. To get optimal solution in minimum number of experiments, we chose three levels of each factor, because if we increase the number of levels, number of conducting experiment goes on increasing and it takes time for calculation. These design factors are important for understanding the effect on response variables. The Selection of Factor and level are tabulated in Table 1 [17, 18]. Before selecting the orthogonal array the minimum no. of experiment to be conducted shall be fixed based on the total no. of degree of freedom. In counting the total degree of freedom the investigator commits 1 degree of freedom to the overall mean of the response under study. So in our experiment, we have selected L9 array, because we have 3 levels and 4 factors i.e. compression ratio (C.R. ), load, ethanol, 2EHN. That’s why we selected L9 array and hence selected orthogonal array shall have 9 run. From the Table 2, it is cleared that for four number of parameter and three level, L9 is best orthogonal array without considering interrelation among factors as it limits the number of run to 9. Hence L9 orthogonal array has been used for my work. Also in present work, we are interested to analyze the effect of individual parameter on response and not on their interrelation hence for this case L = 2N + 1 where N is number of parameter and L is number of trail so L9 array will be selected  (Table 3). For selected L9 orthogonal array, BSFC which determines fuel economy of engine is selected as Response. Similarly for emission characteristics, Smoke and NOx were selected as response they are dominating emissions in case of CI engine (Table 4). Using L9 Orthogonal array Fuel Samples were prepared using 2EHN and Ethanol based on their level assigned. Table 5 shows details composition of fuel Sample . There are multiple additives available for diesel fuel. Oxygenate additives is used to improve the oxygen content of diesel fuel during combustion while cetane improver improves cetane number hence burning capacity of fuel. During literature survey it is found that ethanol is getting popularity as alternate fuel/additive for diesel while 2EHN is most commonly used cetane improver [22, 23, 24]. A typical computerized single cylinder 4-stroke diesel engine is used for experimentation work. Table 6 presents the specification of engine test rig. An AVL 444Di gas analyzer was used for measuring the CO, HC, NOX emission and smoke density was measured using AVL 437 smoke meter. Samples are prepared as per specification in Table 5. Then each sample is tested for given test condition as per Factor level allocation shown in Table 4 (Tables 7, 8; Fig. 2). There are many multiple attribute decision making (MADM] problems we face in our day to day life. MADM aims to select the best from the existing ‘‘alternatives’’ by considering multiple ‘‘attributes’’ which are frequently in conflict with each other. 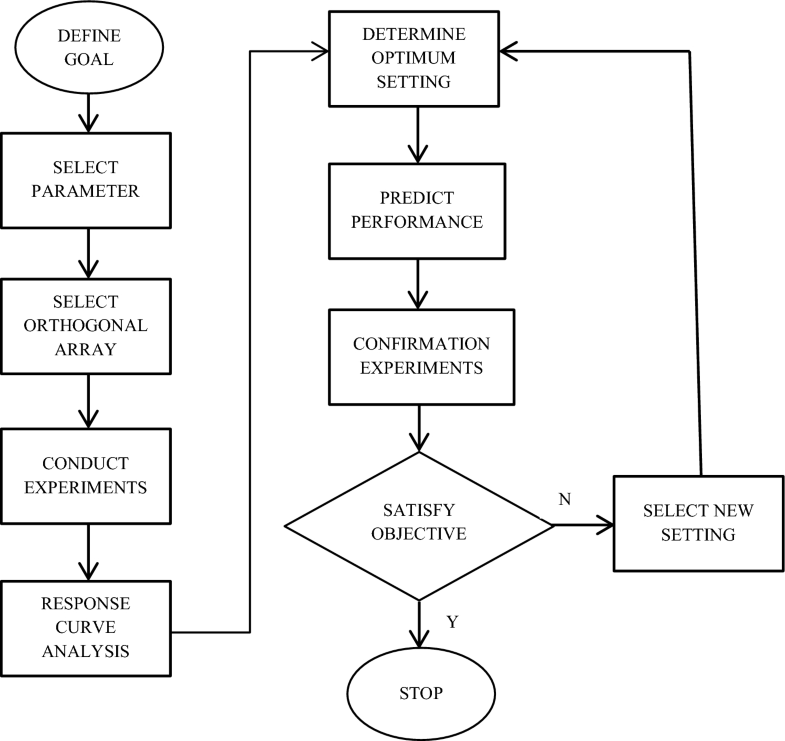 There are several common techniques for solving MADM problems, such as simple additive weighting (SAW), Technique for order preference by similarity to ideal solution (TOPSIS), analytical hierarchy process (AHP), data envelopment analysis (DEA) and Grey Relation Analysis. Grey relational analysis (GRA) is part of grey system theory, which is useful for solving problems with complicated interrelationships between multiple factors and variables. GRA has been successfully used in solving a variety of MADM problems in past. GRA solves MADM problems by combining the entire range of performance attribute values while being considered for every alternative into one, single value. This reduces it to a single attribute decision making problem. Therefore, alternatives with multiple attributes can be compared easily after the GRA process . In GRA method, raw data of response parameter were normalized between 0 and 1 with smaller the better characteristic equation no 2. This is called grey relational generation. Here ‘1’ being most deserved parameter [22, 26, 27, 28, 29]. For lower the better, following formula is used to convert raw data into normalized data. where i is trial number for that particular response (Table 9). In this normalized data is subtracted from reference optimized value that is ‘1’ to identify its deviation from most preferred response (Table 10). where y0 = most derired normalized response. Result of grey relation coefficient using above formula is tabulates in Table 11. Grey relation grade is calculated using Grey Relation Coefficient. The higher the value of GRG is the greater is the desirability. A GRG obtains from the grey relational analysis was used to optimize the process parameters of performance characteristic. The experimental result shows that parameter compression ratio has the most significant effect on the performance characteristic. Therefore, the integration of grey relational analysis and the Taguchi method can be applicable for the optimization of process parameter and help to improve process efficiency. Wp = weighting value for each grey relation coefficient ranging from 0 to 1 and sum of Wp is always 1. In present study since we want to control each response equally important so are assign weighting factor as 0.33 [30, 31]. Grey Relation grade calculated by above formula is tabulated as below. The higher grade correspond to a better S/N ration respectively as it’s is closer to computed ideal S/N Ration. It is observed from the Table 12 that the experimental run No. 3 scored the first rank hence can be considered as the best optimum experimental sequence to provide the best strategy to obtain the optimal solution for satisfying the set multiple objectives simultaneously. Due to orthogonal experimental design, it is then possible to separate out the effect of each operating parameter on the grey relational grade at different levels, for e.g., design Factor CR is at Level 1 for experimental run no. 1–3 so Response grade for CR at level 1 is average of Grade from Table 11 for these runs which is equal to 0.7127. Similarly for all other design factor at respective level grades are calculated and tabulated in Table 12. Total mean GRG is average of all GRG obtained in Table 11 and is calculated as 0.7040 [27, 28, 31]. It is observed from Table 13. That Ethanol is most significant and desirable factor as it shows highest S/N and least mean effect on GRG which control the entire response variable. It shows least deviation from the most desirable value which represented by Delta value from mean i.e. 0.0460 hence ranked as ‘1’.Then factor CR is having highest S/N ration which represent least value of response hence ranked as ‘2’, hence next desirable factor to control. After the estimation of optimal parameter setting, prediction and confirmation for the improvement of quality characteristic using the optimal setting is performed. The estimated grey relational grade ‘γ’ using the optimal level of the design parameters is calculated as shown in Eq. (5) . The confirmatory experiments were carried out at optimum level predicated from result. Table 13 present an assessment between input parameter with the estimated parameter under optimal conditions which show good agreement (Table 14). The general linear model procedure is used to conduct an ANOVA tests the hypothesis that the means of several populations are equal. During ANNOVA for GRG of response, it is observed that, F factor and p value results are not possible due to limitation of degree of freedom as denominator of F is zero, Hence we need to skip one of factor during ANNOVA. It is observed that factor ‘Load’ is continuous variable and can’t be kept constant for optimum operation of engine. Hence it was skipped during ANNOVA analysis . The result of ANNOVA of GRG for remaining factor is tabulated in Table 15. It is observed that F value is highest for CR and least for 2EHN.The p value for the interaction term (0.959 for CR, 0.953 for ethanol and 0.976 for 2EHN) is greater than 0.05. Thus, the interaction of the subject and degree factors is not significant, and you are free to consider the effects of the individual factors separately. As seen from Fig. 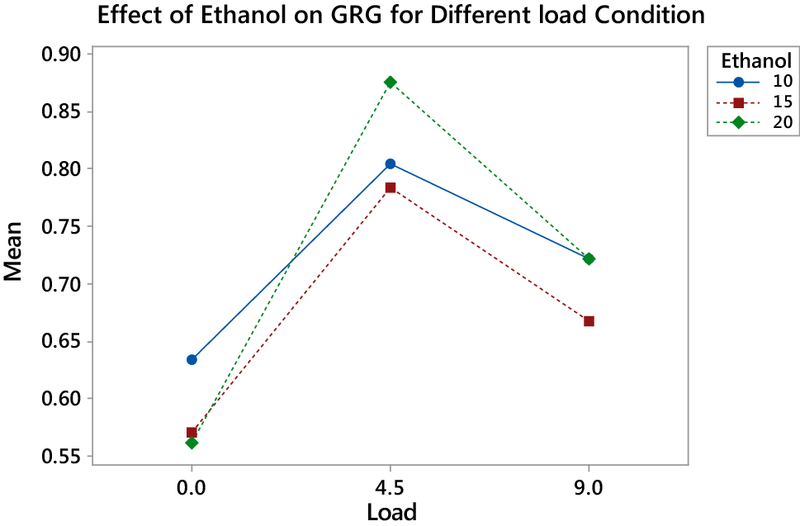 3, value of GRG is least for ethanol percentage of 15% for load condition. Hence Ethanol must operate at level ‘2’ that is 15% as this is most desirable condition for optimized emission control. As seen from Fig. 4, value of GRG is highest for CR of 15 and least for CR value of ‘17’ except at load condition of 25%. Hence most desirable level of CR is ‘3’ that is 17. As seen from Fig. 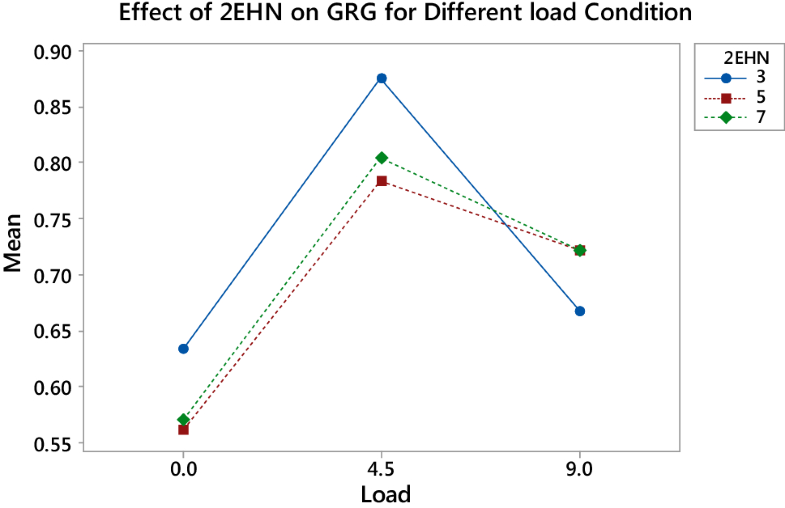 5, 2EHN gives highest value of GRG when used at 3% and least when used with 5% proportion. Hence for optimize emission control 2EHN must be maintain at level of ‘2’ i.e. 5%. It is also observed that effect of 2EHN at level ‘2’ and ‘3’ are quite close hence can possible to use interchangeably without much difference. This Fig. 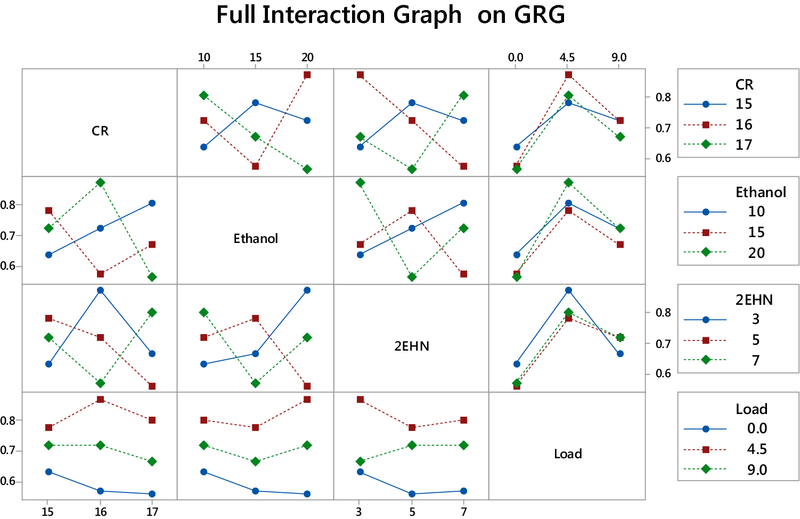 6 help us in understanding the behavior of different factor on GRG when interact with each other. It is observed from fig. that CR at 16 gives minimum value of Emission when used with 15% ethanol and 7% of 2EHN and at ideal condition. So we can say CR 16 is most desirable when considered interaction with other factor also. When we study effect of ethanol, it is observed that to get minimum emission, ethanol at 15% with CR of 16 and 2EHN of 7% need to be maintained and we get best result idle load condition. Its observed that CR interact highly with ethanol and 2eHN which shows CR affect the engine performance of engine fueled with additive in sensitive manner, While variation of load has no significant effect with variation of other factors. We generate a normal probability plot and perform a hypothesis test to examine whether or not the observations follow a normal distribution. H0: data follow a normal distribution vs.
H1: data do not follow a normal distribution. The vertical scale on the graph resembles the vertical scale found on normal probability paper. The horizontal axis is a linear scale. The line forms an estimate of the cumulative distribution function for the population from which data are drawn. A one-sample hypothesis test to determine whether the population from which you draw your sample is non-normal. Many statistical procedures rely on population normality, and using a normality test to determine whether to reject this assumption can be an important step in your analysis. The null hypothesis for a normality test states that the population in normal. The alternative hypothesis states that the population is non-normal. To determine whether your sample data come from a non-normal population, you can choose from four tests. We have performed Normality test using Anderson–Darling test. This test compares the empirical cumulative distribution function of your sample data with the distribution expected if the data were normal. If this observed difference is sufficiently large, the test will reject the null hypothesis of population normality. We can test normality by two way, one if the p value of these test is less than your chosen a-level, you can reject your null hypothesis and conclude that the population is non-normal. And secondly using graph. If the observation follows straight line it indicate it follow normal distribution and population is non-normal. It is observed from Fig. 7 that distribution BSFC observation is non-normal since p value is less than 0.05 hence it reject the null hypothesis. The reason for this uneven fuel distribution and different combustion process characteristics at various load conditions which result in uneven consumption of fuel. 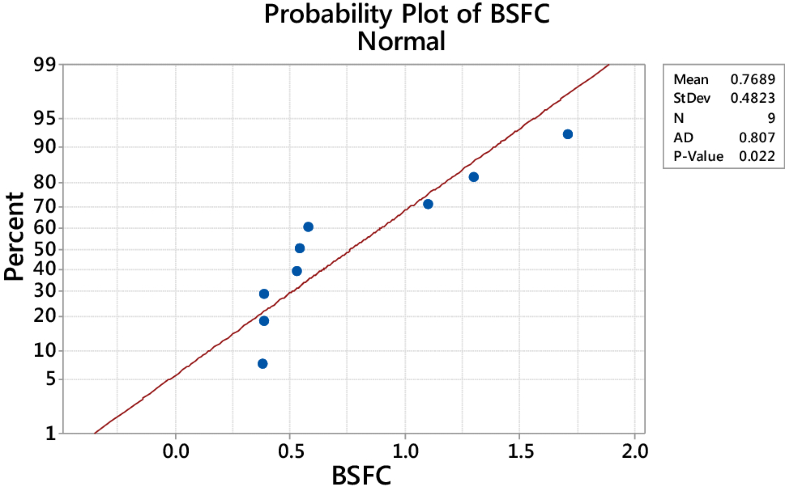 Hence BSFC observation follows non normal distribution. In case of NOx formation it is observed that the NOx formation follow a somewhat normal distribution since p value is higher than 0.05. still there population is not a exact straight line showing some non-normality in the observation as visible in Fig. 8. The reason for this may be uneven temperature distribution during the combustion process and also consideration of combustion at various load conditions. 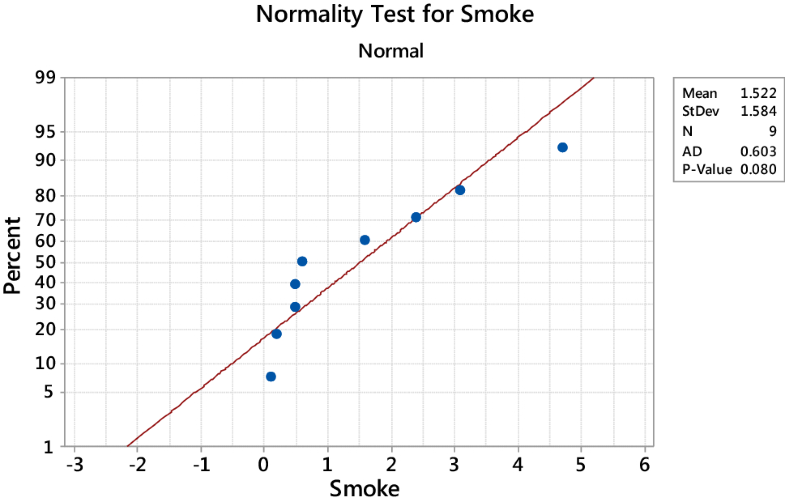 Normality test for Smoke satisfy the null hypothesis as seen from Fig. 9 where we get p value greater than 0.05 with less distortion of population from normality line. The reason for this may be is that Smoke formation value is less and very much close to each other representing little variation. Here multiple response objectives are converted into single objective using Grey Relation analysis in the form of Grey relation grade. 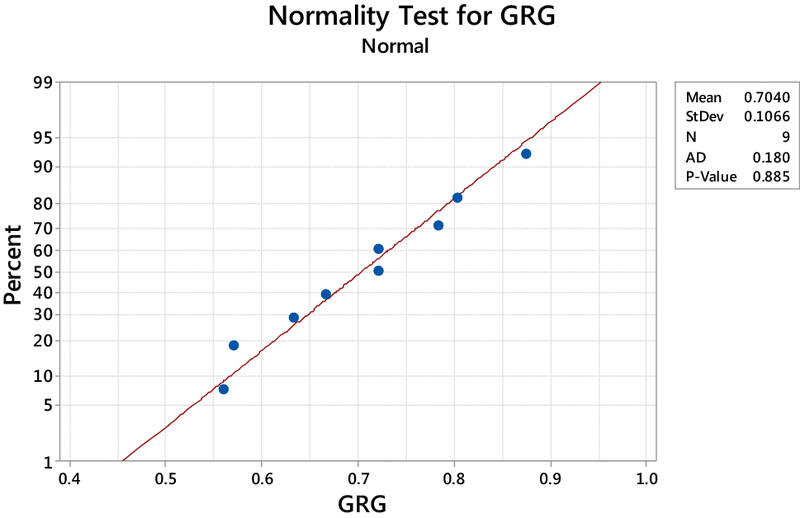 When we perform the normality test for GRG it satisfies the null hypothesis showing normal distribution of response. The p values are much higher than 0.05 and also GRG observation quite closely follow normality line. The reason for this may be is that whatever distortion of individual response is nullified when we first normalized the data and during the Grey Relation coefficient formation (Fig. 10). Regression analysis is used to investigate and model the relationship between a response variable and one or more predictors (factors).There are different methods of regression analysis and selection is dependent on type of response. Both generalized linear models and least squares regression investigate the relationship between a response variable and one or more predictors. A practical difference between them is that generalized linear model techniques are used with categorical response variables, and linear regression techniques are used with continuous response variables. Both generalized linear model techniques and least squares regression techniques estimate parameters in the model so that the fit of the model is optimized. Least squares minimizes the sum of squared errors to obtain maximum likelihood estimates of the parameters, whereas generalized linear models obtain maximum likelihood estimates of the parameters using an iterative-reweighted least squares algorithm . In many cases, the differences between the LS and MLE results are minor, and the methods can be used interchangeably . As observed in normality test, response not following exact normal distribution, hence Box-Cox transformation is used to make our data approximately normal so that we can complete analysis. After regression analysis, we get following equations using optimal λ Box–Cox transformation. The higher the GRG is the closer will be output value to the ideal value. Thus, higher GRG is desired for optimum performance. Therefore, the optimal parameters setting for better BSFC and lesser NOx and Smoke are (A2B2C3D1) for run no 5 as presented in Table 11 highest grey relational grade. 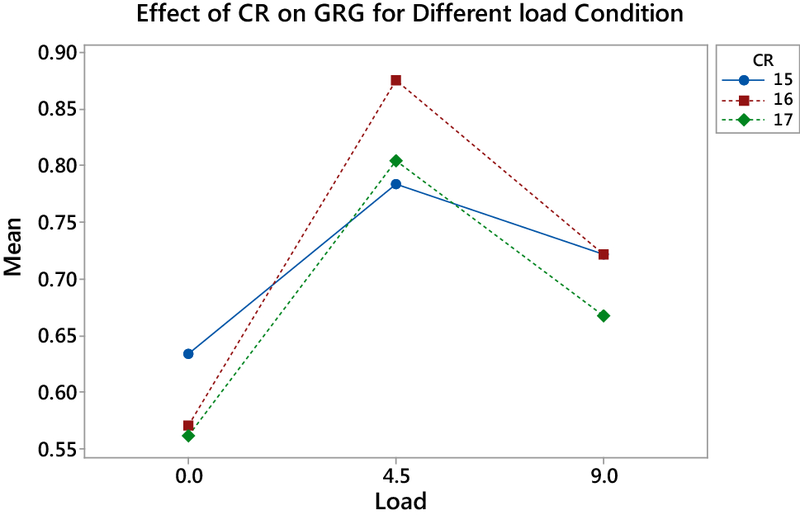 GRA can also be used to separate the effect of each factor and identify the significance of individual factor and its optimum level using mean GRG. As seen in Table 12, we get optimum response when CR is 17, Load at 4.5 kg, Ethanol with 10%. As per confirmatory experimentation as shown in Table 13, It is observed that our predicated optimum sequence GRG is 0.8155 which quite close to predicated GRG i.e. 0.8387. Compared with initial setting of sequence at level 1, our optimum sequence gives better Fuel economy and lesser NOx emission with little increases in smoke.